The installation of a package which violates the quality standards isn't allowed. This could cause serious problems on your computer. Please contact the person or organisation who provided this package file and include the details beneath." This is a known good package, the linitan errors are valid - but a deb should not have to comply with the latest policy standards to be able to be installed. These two errors do not inherently make a package of bad quality. However, there should always be the ability to say, "No, i know better - please continue". I can confirm this bug when trying to install the latest Dropbox .deb (https://www.dropbox.com/downloading?os=lnx). I also can confirm this bug when trying to install the google-talkplugin for .deb (http://www.google.com/chat/video/download.html). Since these same packages that software center refuses to install can be installed using "sudo apt-get install PACKAGE", this is a serious issue for those uses left wondering what happened. I can also confirm this bug with latest dropbox .deb file using Ubuntu Software Center version 3.1.20 (Natty). 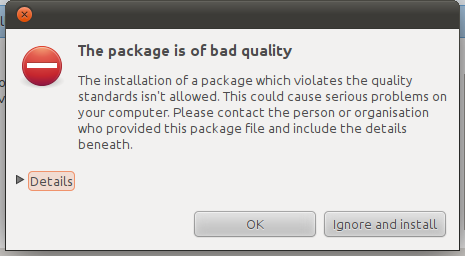 The error dialog should in the case provide an action to force the installation of the package. You just have to call aptdaemon.client.install_file(path, force=True) to override the warning. Will not let me install Google Chrome and Skype either. Apt-get won't help, and dpkg will complain about dependencies. gdebi will manage to install your chrome/skype/talk-plugins/etc. I looked at this and I think instead of using "-F" (the ftpmaster-reject option) we should add our own file based on that. Its e.g. fine to have a package installing stuff in /opt or with a missing copyright file. But others (like no-package-name, no-version-field) we definitely want. Still reproducible in Alpha 3. Can't call method "data" on an undefined value at /usr/share/lintian/checks/deb-format line 63. I tried to install teamviewer and received same error. ATM lintian is just a recommend of aptdaemon, if you don't need it otherwise then just remove, aptdaemon will not error in it's absence. This is a pretty major bug isn't it? Can't install Skype, Chrome, Dropbox, etc. It's the one thing keeping me from using Ubuntu. Love the new interface, close to being a convert, but not having skype and chrome are big holdups. Yep and it's got a pretty high importance. I was unable to install Skype and CrossOver. Hopefully this is fixed soon. I was able to install GDebi using the package manager for installing .deb files. Still present in beta 1.
i got this bug, too. I have this bug too. still isnt fixed. I have this bug in Natty Beta 1 64-bit, and using the terminal to install with dpkg is not working either for Chrome. Should be 'sudo dpkg -i name_of_pkg.deb' and that's encountering errors while processing, failing after processing triggers for python support. Dpkg worked for Skype. that works well for me for google talk plugin !!! just right click the plugin and open it whit GDEBI package insaller after those steps ! Similar errors as the main post for Teamviewer 6 as well. You can however install the Google plugin and Teamviewer 6 with "sudo dpkg -i (*.deb file)". Affected by this bug when i was trying to install chrome, dropbox, teamviewer 6, and a long etc. I uploaded a new version now that massively relaxes the checks. Some stuff is still checked, let me know if there are failures, but now it should really only test for critical issues. I have tried installing World of Goo but I got the same problem again. I've got the download from the humble bundle site, so it's perfectly trusted. I get the same problem too with Google App Inventor, so it's not a bug in the World of Goo package. I've also tried installing Skype, this does work for some mysterious reason. I'm running 11.04 with the latest updates. Please note that I do have a PPA with the latest daily of Unity, but I don't think that's the problem. I run Ubuntu 11.04, latest updates. I do run the 64-bit edition. And again, Skype didn't install before and now it does. But the fix doesn't work for all software, in fact, it doesn't work for most software. Travis Reeder, I'm sure that if you don't use Ubuntu, this bug is not the reason. If you would like Ubuntu you would use a finished version and not look for developing versions. I tried to install LSB printer drivers , but that failed with the error message below. LSB printer driver packages don't have a direct dependency on libc, because they depend on the lsb package. The lsb package has to depend on libc to conform to the LSB. So I re-installed Ubuntu 11.04. I've got the latest updates from the main-server and I run the 64-bit edition. I regret to say the 'fix released' status is false. The problem still exists with a lot of packages. At the moment I'm not able to install World Of Goo or Google App Inventor for example. Both well-known products from reliable and trusted sources. I should tell you that I am able to install Skype since the 'fix'. I wasn't before (in Natty). The only problem is that it still doesn't work on a lot of other (trusted) packages. Confirmed with World of Goo and Osmos deb files, both from the Humble Indie Bundle. Ugh, please make sure that any override to allow the installation of crappy packages gives users a big, fat warning about how stupid and dangerous it is to install such packages. I am so tired of these PAID employees churning out such utter crap packages and refusing to follow the Debian policy guidelines. Perhaps if we start calling them on this shoddy development work and publicly shaming these commercial companies for it, they will start to take packaging more seriously or even work with Ubuntu to have them properly packaged in the partner repository. LSB compliant printer drivers with a libc dependency as distributed via the Linux Foundation's OpenPrinting Database still fail to install. These packages do not specify an explicit dependency on libc but rely on the distribution's lsb package to do so. The LSB is clear about what API of libc has to be present. Compliant drivers only use what is in specified in the LSB. Please remove "missing-dependency-on-libc" from data/lintian-checks. It is already listed in a non fatal section, so please don't bomb on this. FYI, the drivers distributed via the OpenPrinting Database are normally installed automatically when people connect their printer. This is a new feature in Natty and works fine. However, manually downloading that same driver and double clicking it bombs. It really shouldn't, at least not because of an indirect libc dependency via the lsb package. Actually this is also a software-center issue. Since sc doesn't allow to override the lintian test. It must be possible to install LSB-based packages. To make them distribution-independent, they do not have lots of dependencies (like on libc) but depend only on the meta package "lsb" which in turn is dependent on everything what the LSB requires. These packages should be installable with Software Center, also architecture-independent packages without any dependency should be installable with Software Center. Reopening. This needs to get fixed in Natty. For the convenience of translators, I've attached a screenshot of the dialog that is displayed to allow the user to choose to continue the installation of a deb that has been found to have packaging problems. The new string is for the "Ignore and install" button. Shouldn't the icon be the gtk-dialog-warning instead of gtk-dialog-error? The message would need some rewording, too; "isn't allowed" is not true any more. No está permitida la instalación de un paquete que viole los estándares de calidad, ya que este podría causar graves problemas en el sistema. Favor de contactar la persona o la organización que provee este paquete e incluir los detalles subsiguientes. L'installation d'un paquet qui viole les standards de qualité n'est pas autorisée. Cela pourrait entraîner des graves problèmes au système. Veuillez contacter la personne ou l'organization chargée de fournir ce paquet et inclure les détails ci dessous. Please redirect me to the place to post these translations next time. Happy to contribute. Sorry but the changes to software-center don't cut it for the distribution independent LSB compliant printer driver packages. The real problem is not just that you can't force installation of the package, it is also the fact that these printer drivers are labelled "bad quality" on insufficient grounds. Don't get me wrong, I'm all for applying quality checks on third party packages before installation. It's a Good Thing. The problem that we have here is that the implementation is questionable. The quality checks that are applied here, a subset of those provided by lintian, check for Debian Policy compliance and a few questionable packaging practices. Debian Policy is distribution specific, for the Debian distribution to be precise, and concerns itself with packages meant for that distribution. It makes little to no provisions for the LSB. Now aptdaemon goes ahead and tries to impose these distribution specific compliance tests on a package that is a) not part of Debian, b) meant to be distribution independent and c) LSB compliant. Failing any of the Debian specific compliance checks does not warrant a "bad quality" label. Feel free to pull the distribution independent LSB compliant printer driver packages through LSB compliance tests and label them "bad quality" when any of those fail, but please don't do so for failing a Debian distribution compliance test. That said, please remove "missing-dependency-on-libc" from data/lintian-checks. L'installazione di un pacchetto che viola gli standard di qualità non è permessa. Questo potrebbe causare seri problemi al tuo computer. Per favore contatta la persona o l'organizzazione che ha fornito questo pacchetto includendo i dettagli qui sotto. I have checked the new package now and the problem is actually fixed. Thank you very much. I can confirm that this problem is fixed. It still gives the error, but with the option to 'ignore and install'. 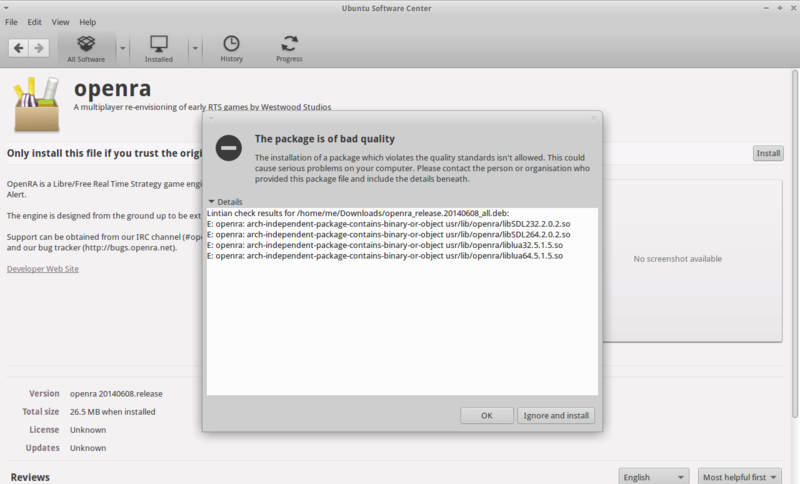 The only thing I don't get is why World of Goo for example never gave any errors in previous Ubuntu releases. Did the software center become more strict in scanning packages, or is this quality check entirely new? Re #52, we've also checked a few affected LSB compliant distribution independent printer driver packages and they are no longer labelled "bad quality". Thanks! I have somewhat related problem with this error. I had a 10.10 instal where I used SecureCRT 6.7 and inSSIDer (both Linux 64bit versions). They worked fine. Then I made an upgrade to 11.04 beta 2 and both apps worked fine. But after I made a fresh install of 11.04 beta 2 I could not install both apps from the same archives I used before. Both give me this "Bad Quality" errors and even if using GDebi they install fine both do not start, ever. As I said the archives used are exactly the same which worked before so I am not sure where is the problem. I running Xubuntu 11.04 64bit and this problem appeared for me first time today. Adam - Does sudo dpkg -i <packagename>.deb work? If not, is there any different output? madbiologist: It does work but it's merely a workaround, not a fix for this problem. I wonder if I should open a new bug report for this. just a packaging bug done by Google. I just tried it again in Ubuntu 13.04 and I was able to install Chrome. I can confirm this still exists in the Software Center when using xubuntu 14.04. See attachment for screen shot of the errors - in this case errors about object files.